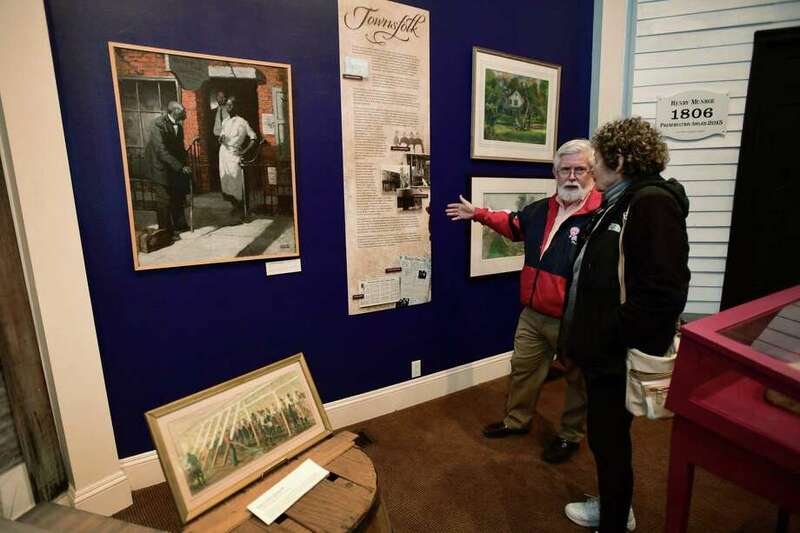 Westport resident Bill Armstrong and his wife Rindy Higgins look over the exhibit, Remembered: The History of African American’s in Westport, Tuesday, February 5, 2019, at the Westport Historical Society in Westport, Conn. The Society is offering free admission to its award-winning exhibit during Black History Month. Exhibit Hours: Tuesday - Friday 11 - 6pm, Saturday: Noon to 5, closed Sunday and Monday. The Curio Cottage Thrift Shop, operated by the Westport Woman’s Club, will be offering a 50 percent off storewide sale from Feb. 11-16 during its “Sweetheart of a Sale” leading up to Valentine’s Day. The shop offers an ever-changing array of donated glassware, tableware, vases, platters, frames, jewelry, kitchen items and more. It is open weekly on Monday from 1 to 4 p.m., Wednesday through Friday from 10 a.m. to 3 p.m., and Saturday from 11 a.m. to 2 p.m. It is located adjacent to the Westport Woman’s Club, 44 Imperial Ave. The Curio Cottage, opened in 1999, operates year-round and has contributed over $500,000 in support of the philanthropic mission of the Westport Woman’s Club, which includes direct grants and services to nonprofit organizations and charities throughout Fairfield County. Leading Stamford-based architecture and interior design firm MKDA, this year celebrating its 60th anniversary, announced the completed renovation of 55 Post Road West in Westport on behalf of joint venture partners Homewood Real Estate and ClearRock Properties. The renovations transformed the 1971 building which, until 2018 had been occupied by a single tenant, into a multitenant facility. According to MKDA, interior renovations at the 39,000-swuare-foot, three-floor property include a new lobby, elevators, bathrooms and common corridors. Exterior renovations intended to enhance the building’s distinct architecture and expansive window line include a new entrance, landscaping and parking garage screens. The single ticket, multifaceted event entitles participants to enjoy a three-course meal at one of eight downtown restaurants, then see a concert at the Seabury Center and return to any of the same restaurants for happy hour pricing for drinks. The ticket for this event will be $75 per person. The concert will feature the husband-and-wife led band David Wax Museum, whose sound the New York Times called “global crossover music at its best” with its mix of folk, rock and Americana. They have played all around the country including the main stage at the Newport Folk Festival. The restaurants participating in this collaboration includes: 190 Main, Amis, Rothbard, Spotted Horse, Tavern on Main, Jesup Hall, Matsu Sushi and now Wafu, each within two blocks of the Seabury Center on Church Lane. The dinner seating will take place at 6 p.m. with the concert beginning at 8 p.m. Tickets are first bought online through the chamber, then reservations are made on a first-come, first-served basis once again through the chamber. Drinks and tips are not included in the price of the ticket. For more information and to purchase tickets go to www.westportwestonchamber.com/supper. The Fairfield Chamber of Commerce and the Westport Chamber of Commerce will host its annual combined February Business After Hours on Feb. 13, from 5:30 to 7 p.m. at the Westport Inn. The event is an informal, after-work gathering for chamber members, prospective members and guests. It is an opportunity to network with other business associates and colleagues, exchange ideas, obtain business leads and make professional referrals and friends. Attendees are encouraged to have their business cards ready to hand out, to expand their local networking base by meeting new people from Westport and Fairfield. This BAH is a theme-based Happy Valentine’s Day event, celebrating “We Love our Chamber Members.” Attendees will enjoy lively discussions, idea sharing and conversations with colleagues, chamber members and their guests. Also included are door prizes (including a complimentary room rental), tours of the Westport Inn, drinks and light appetizers. Tickers are $25 for chamber members and $50 for nonmembers. Walk-ins will be charged an additional $5. For ticket reservations or more information, call the Fairfield Chamber of Commerce at 203-255-1011 or register at www. FairfieldCTChamber.com. Westport firefighters recently made a $2,290 donation to the Honor and Remember Organization, whose mission is to recognize the sacrifice of America’s military fallen service members and their families. The primary symbol of this recognition is the Honor and Remember Flag, which is made for and presented to Gold Star families and is intended to fly continuously as a visible reminder to all Americans of the lives lost in defense of our national freedoms. The funds were raised solely from donations made by members of the Westport Fire Department. Gregg Barratt, assistant director of the Honor and Remember CT Chapter, presented the Honor and Sacrifice Flag to the members of the department.